See more pictures from this show. 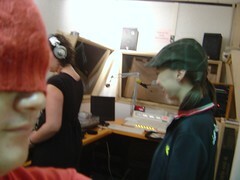 Halloween is fun on the radio. We get to play spooky music and decorate the air room with orange lights and tell ghost stories. We also pull out our “spookiest” Halloween-ish house music – expect some dark, devilish fun! I can hardly wait! In Hawaii we call them “Obake” (Japanese word for ghost) tales or “Chicken Skin” stories. 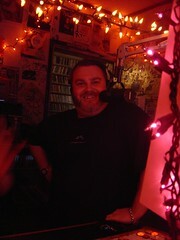 This year we’ll be playing at least one ghost story from Hawaii storytelling legend, Jeff Gere. Jeff Gere puts together the Talk Story Festival every year at the McCoy Pavilion and brings together storytellers from around the world. Last week Bubbles and I saw him tell spooky stories at the Japanese Cultural Center in Makiki. He can tell one heck of a spooky story! But what would The So Very Show be without the SoVery mix? This week we are very privileged to have San Francisco house dj Buck behind the decks. DJ Buck has been a part of Leaf Recordings and done a ton of 12″ and remixes. Buck describes his music as psychadelic – we describe it as good fun! 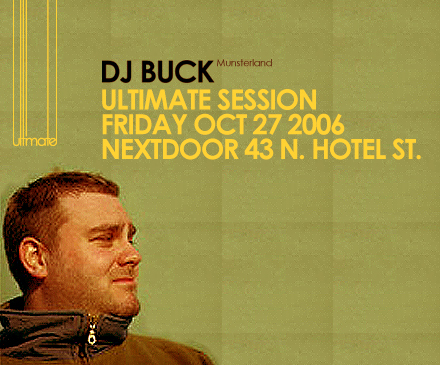 Buck is in town to play for ULTIMATE, the new monthly at Next Door which kicked off with JoJo Flores last month. For more info on Next Door, visit www.whoisnextdoor.com. You are currently browsing the The So Very Show weblog archives for the month October, 2006.